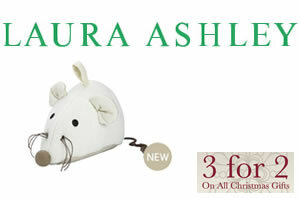 Laura Ashley have recently added a new doorstop to their collection, the Mouse, a cream cotton doorstop. Although this new addition is still full price, Laura Ashley are running a promotion across all their other fabric door stops – Buy 3 doorstops for the price of 2! Their Christmas gift collection is also being promoted and it is a great opportunity to offer a practical but lovely interior decoration items to friends and family. We always keep our eyes open for discounted designer fabric and now is the perfect time to grab a great deal with Laura Ashley. A large selection of fabric have been reduced by 30% including children’s fabric, curtain fabric, upholstery fabric and PVC fabric. Some of the fabric only cost as little as £4.55 per meter so don’t miss out on this deal and stock up on the latest fabric for these cold winter days when you will be planning to work on your sewing projects!